This was a really enjoyable project we completed last August, and a great example of how with a little planning you can create an entirely new space for the whole family to enjoy. 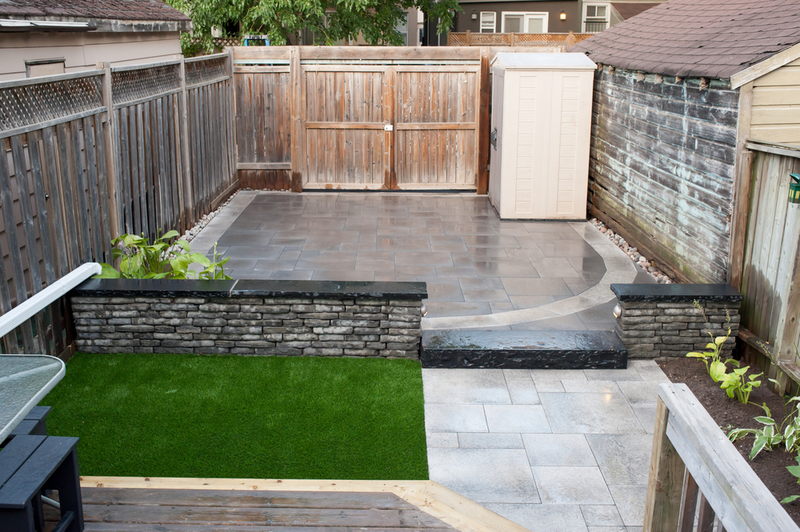 Its a small property, but one with lots of potential; the homeowners were looking to make their outdoor space more functional and welcoming. They wanted to create a space that their kids could enjoy which also required minimal maintainance. Enter the LITTLE Landscapes crew! New (and much safer) steps to the basement using Unilock Pisa II retaining wall blocks. With a stunning design that was created by Sylvie De Brabandere, and a modern grey colour scheme created using Unilock Umbriano stones in Midnight Sky and Winter Marvel we were able to create an inviting, eye catching space that makes you excited to be outdoors with family & friends. 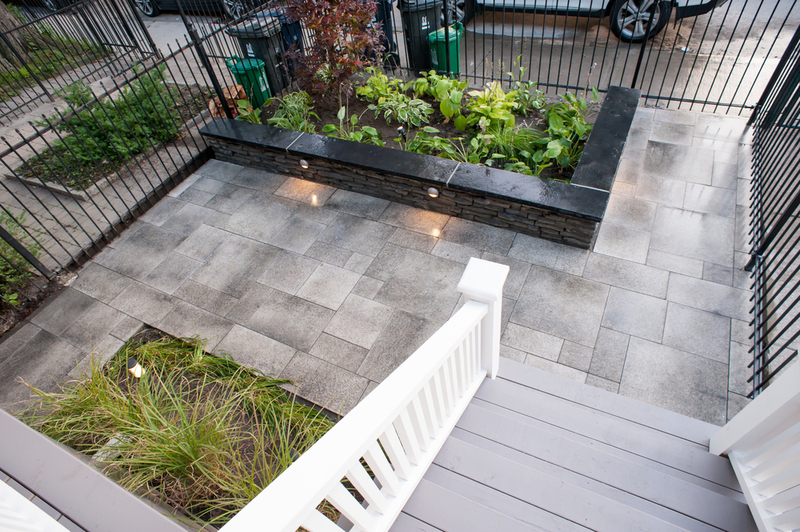 We kept the palette clean and sleek with tones ranging from dark slate to light grey, and tied it all together with easy-to-maintain hostas from the client's previous gardens. The seat walls are made out of Unilock's new Rivercreast wall system, and are topped with Banas Kota Black coping stones. This feature offers extra seating when entertaining or relaxing with the kids in the summer, and separates the two areas beautifully. To take you up to the back patio area, we tied it all together with a stunning Banas Kota natural stone step which compliments the colours of the design and keeps the overall look clean & modern. One of the elements this couple was excited about was the addition of a section of synthetic turf. This is a high quality, very natural looking product that offers comfort for tiny feet as well as the added bonus of a zero maintenance lawn. No more worrying about watering the grass-patch or having to cut the lawn. Since this is the only "grass" on the property it was a perfect way to cut down on maintenance while leaving all the added function of a green space. Another stunning feature of this job was the addition of carefully placed lighting fixtures. Outdoor lighting is a detail that not only adds safety and visablity to your space but also an element of elegance. Here we inserted lights from InLite into the new deck steps, and on the edges of the Natural Stone Step in the backyard. 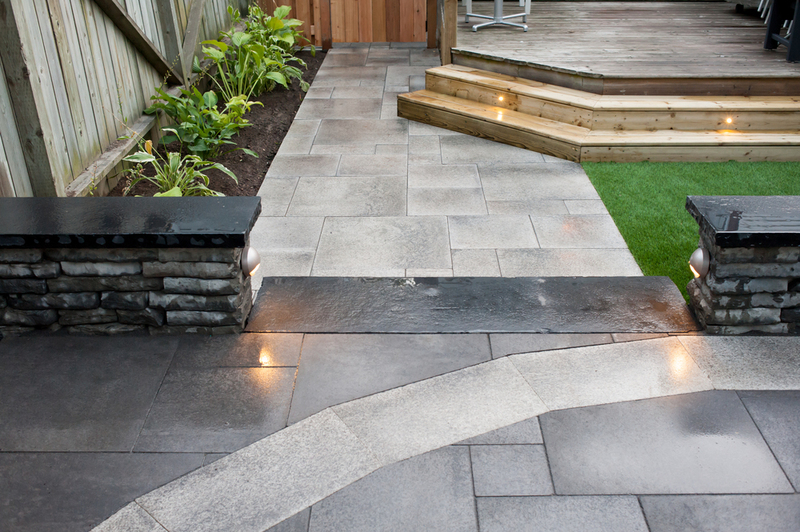 You'll notice that we've also added accent lighting in the front yard and in the garden areas as well. The extra hint of light in the evenings offers both functionality and beauty.